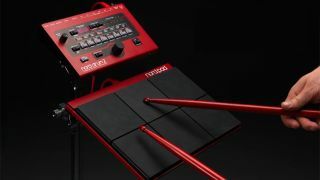 The Nord Drum 2 and Nord Pad: a perfect combination? MUSIKMESSE 2013: As well as announcing the Nord Lead 4 Clavia is also bringing the Nord Drum 2 to Musikmesse. Better still, you'll be able to play it using the new Nord Pad controller. The Nord Drum 2 looks similar to the original Nord Drum (which, let's not forget, is only a year old) but offers six channels as opposed to four. You also get stereo outputs - the original had just a mono output, which was somewhat limiting for some users. There are also six trigger inputs that can be used when you hook up the new 6-pad Nord Pad - or a different controller, for that matter. More details when they come in.The Nord Drum 2 and Nord Pad will both ship in May priced at £399/€499 and £199/€259 respectively.